In something a little under an hour guitar Duo Noire treat us to six New Music duos for classical guitar. All this in the new album Night Triptych (New Focus FCR210), the title of which is derived from the composition of the same name by Golfam Khayam. 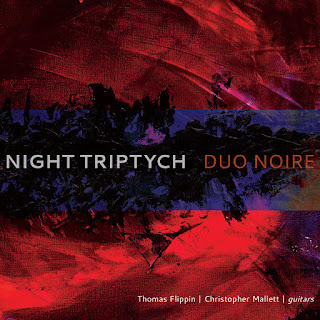 Duo Noire, aka Thomas Flippin and Christopher Mallett are talented exponents of the contemporary classical guitar, with technique to spare and an interpretive acumen that serves them well in bringing to us the subtleties and sonic pleasures of each composition in the program. As I listened repeatedly to the offering I was reminded that there is something of a consensus nowadays as to the firmly grounded middle ground upon which contemporary classical guitar music currently stands. The edge of conventional soundings are a part of the presentation, a harmonic-melodic adventuresomeness, and a kind of synthesis of what the guitar has been and can be classically but also as drawn out of general guitar practice in the past century. The result is a sort of state-of-the-art view of what we can understand and appreciate today. So as a whole there are bellwether bench marks and distinctive sound universes to be had in the program at large. It gives us Clarice Assad's "Hocus Pocus," Mary Kouyoumdjian's "Byblos," Courtney Bryan's "Soli Deo Gloria," the previously mentioned "Night Triptych" Gity Razaz's "Four Haikus," and finally Gabriella Smith's "Loop the Fractal Hold of Rain." All the composers are living and all the works show a great respect for the traditional and more modern idiomatic world of the guitar and its special sounds. This program is a bit of a sleeper. Nothing introduces itself with skyrockets and 28 tuba fanfares, and so much the better because the music and performances stand out after a while of listens. It is thoroughgoing, most musical in design. It is not music to upset the applecart of assumptions in the contemporary music spheres. It does not need to do that because one gets something of lasting worth not just a shock blast of newness! I most definitely recommend this to any with an interest in New Music for guitar. Bravo!